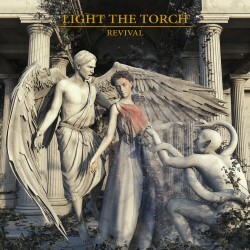 After some rather difficult behind the scenes issues with a former member, Howard Jones and guitarist Francesco Artusato have changed the name of their band from Devil You Know to Light The Torch. Not an easy task after how well their last record was received, hence this album’s not so subtle title in reference to the interpersonal dramas past. Kicking off with all the bombast of Howard Jones’ clean baritone was never going to go wrong after a typical choppy metalcore style intro. ‘Die Alone’ is a huge track on all points as the vocals are kept mainly clean while the guitar weaves around them. The most noticeable thing here is that although the music is heavy, it is rooted in melody. Jones really stretches his clean baritone and uses his earth-rattling growls and screams sparingly, generally popping up for a few lines in a track. Focus is instead on huge musical hooks and more harmonised gang-like vocals to keep the foot tapping, with some of the best vocal work of Jones’ life. It isn’t all melody and harmony though. ‘The Sound of Violence’ is very close to going back to more traditional metalcore musical blueprints and allowing the vocalist off the leash a little as well, the heavier tones of ‘Virus’ and ‘The Bitter End’ see the typical sound shuffled around to keep the friendlier vocal style of the album while allowing the band to kick the overdrive pedal and have some fun with the breakdowns. Overall Revival is quite a surprise in how light on and hooky it is, almost a complete change from the album that the core writing team worked on last time around. Full of earworms that will have you humming for days, if you like your metalcore a little bit more metal, this may not be your thing. Fans of the musicians that make up this band you will be happily surprised.